To begin, the admin user will need to decide if they would like Assemblies posted from the mobile device or only Created and Saved from the device(s). 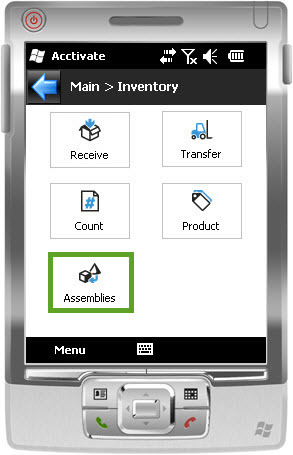 To access this option, go to File > Configuration Manager > Mobile > Inventory Assemblies > Submitting assemblies on the Acctivate desktop app. To allow users to post assemblies check the available box, to disallow un-check the box next to ‘Allow posting assemblies from the mobile device’. After determining the above continue through the following steps to Create and/or post an Assembly transaction from your mobile device. Log into Acctivate on your mobile device. Enter your login information (i.e. Company, User ID, Password) and then click the Login button. On this next window the system will allow you to look up an Assembly Product, type a specific ID into the Prod field, or scan the Product ID from a barcode. Once a product is selected, you can enter in all the pertinent transactional information, such as Quantity, Yield (if process assembly), W/H, Location, Description, Lot/Serial #, Expiration Date, Reference, and Specification. The next window allows the user to review the components used in the assembly item chosen, as well as the quantities used in building the assembly. If you are using the Custom/Process Assembly module and need to adjust the quantity used for any component marked as variable, you can do so by selecting the product and overriding the quantity shown. If you need to modify the list of components themselves, you’ll need to save the session on the mobile device in order to edit this information on the desktop app. This includes adding lines for additional Lot/Serial numbers. Based on the option in Configuration Management listed at the beginning, the next window will prompt you to save the assembly session for future modification and/or posting. If you enabled the mobile users to post the created/modified assembly transaction(s) the check box ‘Post Assembly Session‘ will be available to check. If not, this option will appear grayed out. If using Process assemblies, the user can specific the built Qty and Yield on this window. If you elected to Post the assembly and a listed component has insufficient On Hand quantity a warning message will be displayed: Could not submit assemblies. Component ‘X’ does not have sufficient quantity on hand as of (date). In order to move past this and post your assembly, you must resolve the On Hand Quantity discrepancy prior to posting. The next screen (Submitted) will confirm that the specific Assembly Session has been submitted and/or posted and will display the session number assigned. For example, Inventory assembly session 57 posted, if posted, or Inventory assembly session 57 submitted, if saved only.